Eremophila denticulata is known as the Fitzgerald Emu Bush or Toothed Eremophila. The former name refers to the Fitzgerald River National Park, Western Australia, where this rare species occurs. 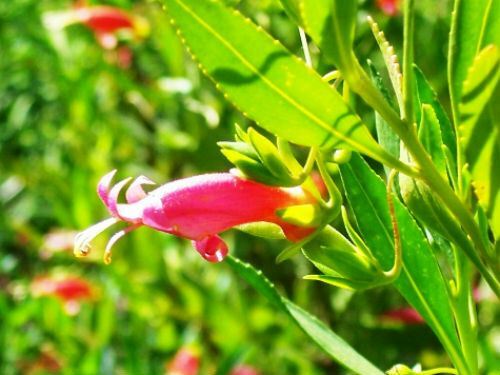 Eremophila denticulata will grow into a shrub from 1 to 3 metres tall. Mature specimens, in our cold climate garden, are about two metres tall. Leaves are slightly sticky to the touch, lance-like in shape with distinctive small teeth around the margins, hence the second common name. Tubular flowers are initially yellow but mature to red. The main flowering period is between September and March. Sporadic flowering will occur at other times. The nectar-rich flowers are carried on characteristic “S” shaped pedicels or flower stalks. The colourful blooms host constant visits by Eastern Spinebills. Apparently this Emu Bush is so rare that it is classified as a vulnerable native plant at risk of extinction in the wild. Fortunately Eremophila denticulata is one of the easiest Emu Bushes to propagate from cuttings. It would probably be safe to say that there are more specimens in cultivation than ever grew in the wild. This species is one of the hardiest eremophilas in our garden. Pruning keeps the plants bushy and blooming bounteously.